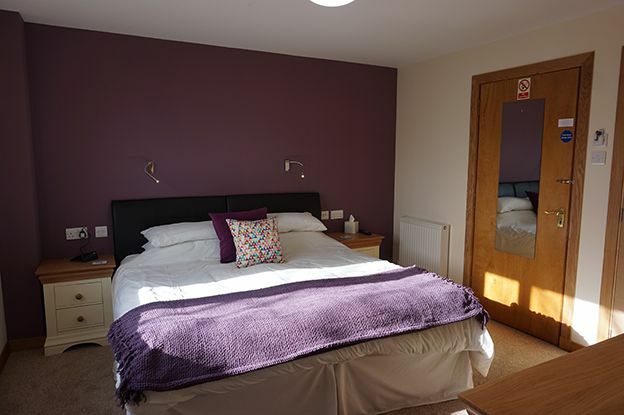 Every month we’re going to take a look at the work of a successful Orkney based business - for February we're featuring Orkney Tourism Group member Karrawa Guest House in Kirkwall. This month the focus is on Albert and Aileen Bruce, owners and operators of the popular Karrawa Guest House in Kirkwall. First impressions are important, especially in the tourism trade. Pulling into the Karrawa Guest House car park, those first impressions are very positive. It feels like you’ve booked yourself into a small hotel rather than a guest house. Each space is lined, there are signs to guide you and new lighting is being installed to illuminate the dark Orcadian winters. Albert and his wife Aileen, who manages the day to day running of the business, bought the Guest House under its previous name in 2012. Although they were newcomers to the bed and breakfast trade, they did have the support of a family member already involved in the tourism industry in Orkney. ‘We were always thinking of doing something like this and when the business and property came on the market, we received a lot of encouragement and advice that convinced us to take the step,’ says Aileen. ‘We have done a lot of travelling ourselves and we love Orkney, so the idea was to combine the two’. Karrawa Guest House is purpose built and features three double rooms, two twin rooms and a family room, all with en-suite facilities. As you’d expect there are tea and coffee making facilities in each room, but it’s the added touch of the Orkney Fudge that makes the difference! 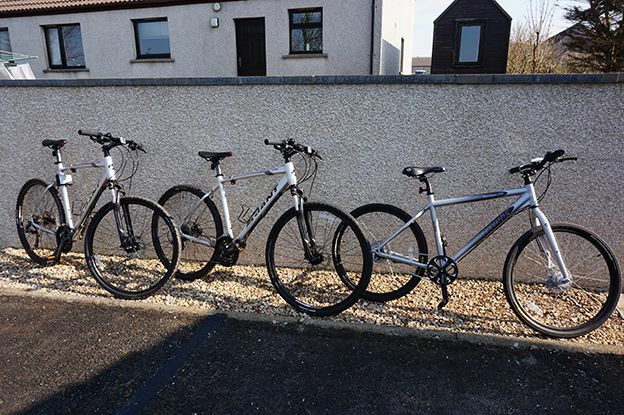 Bike hire is also available, and the Guest House sits just a fifteen minute walk outside the centre of Kirkwall. 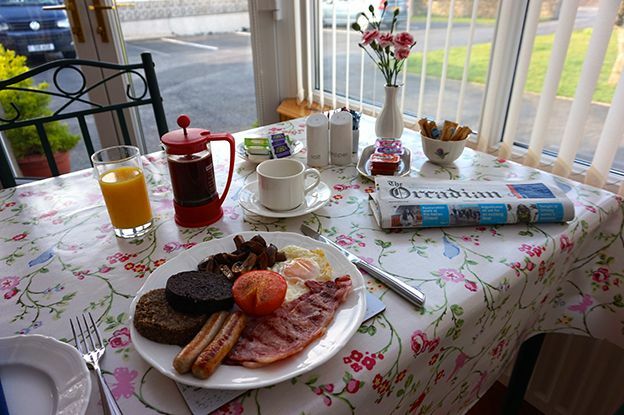 They say breakfast is the most important meal of the day, and that’s certainly the case if you’re about to head off to tour Orkney’s amazing sites. At Karrawa, guests can enjoy the very best local bacon, sausages, black pudding, haggis and free-range eggs, along with healthy options including yogurts, fresh fruit salads and cereals. ‘We want to showcase Orkney as a whole so it’s important to offer local products,’ says Albert. ‘Guests expect that kind of service and it’s great to be able to draw on such high quality items’. But it’s what’s outside that really attracts people to Orkney. Despite being born and bred in the islands, Albert is still surprised at just how positive people are about their stays. ‘They love it. They come here for the archaeology, the landscapes, the seas, the moody skies. A lot of people are here for a few days and leave wanting more – they quickly find that, despite how small Orkney is, they just don’t have enough time to explore it all’. It has been a busy three years for the couple. Not only does Albert work full time as a Firefighter at Kirkwall Airport, they also have two young girls, Annie and Ruby. Add to that the recent renovation of the downstairs guest rooms, with new bathrooms, fixtures and fittings, and it has been a bit of a whirlwind. ‘Running a bed and breakfast anywhere is challenging, but when you add in a growing family and other everyday jobs and chores, it’s certainly busy,’ says Albert. ‘But we really enjoy what we do; it’s a very rewarding experience’. 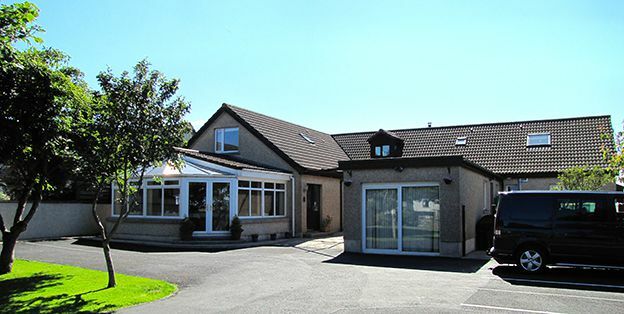 Steadily, the reputation of the business has been built up and it is now one of the highest rated Orkney bed and breakfasts on Trip Advisor. Karrawa already has plenty of bookings over the normally quiet winter months, and 2016 is filling up fast. A new website has also recently been launched, with a secure online booking facility available. And, according to Aileen, there is still work to be done. ‘We’re putting the finishing touches to the garden, and then we want to renovate our upstairs rooms and bathrooms too. There are other little bits and pieces here and there as well, and we have plans eventually to redesign the entrance and reception area. It’s certainly a long term project and running the business is a lot of work, but I really enjoy meeting people and hearing all about their experiences of Orkney’. The bed and breakfast trade might not be the traditional business path for a young family in Orkney, but there are examples across the islands of others following suit. One look at Karrawa Guest House proves it can be done, and it can be done really well. Find out more via the Karrawa Guest House website. You can also follow them on Facebook and Twitter.